Drop 1: Thread 1 headpin though a 6mm Clear AB Square Bead, 5mm corrugated bead, and 6mm Light Siam Bicone bead. Using a pair of flat nose pliers, bend the pin 90 degrees. Using a pair of needle nose pliers, create a loop at the top. use the flat nose pliers to close the loop. Drop 2: Thread 1 headpin though a 3mm Corrugated Bead, a 6mm Clear AB Bicone Bead, and a 6mm Silver Glass Pearl bead. Using a pair of flat nose pliers, bend the pin 90 degrees. Using a pair of needle nose pliers, create a loop at the top. use the flat nose pliers to close the loop. Red Lantern Drop: Thread 1 eyepin though a Bead Cap (wide part down), a Crystal Rondelle, and a 10mm Round Red Resin Bead. Using a pair of flat nose pliers, bend the pin 90 degrees. Using a pair of needle nose pliers, create a loop at the top. use the flat nose pliers to close the loop.Using a 4mm jump ring, attach 3 sets of chain links to the to the bottom loop which is covered with the bead cap. 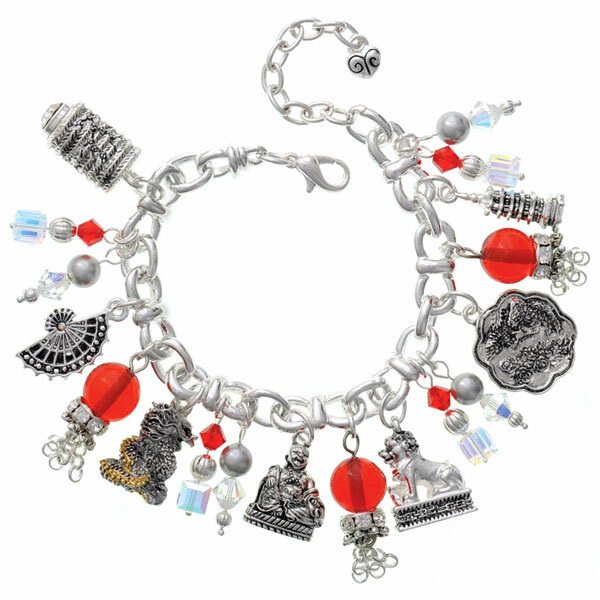 Charms are attached to the bracelet in order of listed materials above. Inbetween metal charms, "Drops" are attached between charms as shown in image above. We used the 6mm jump rings to attach the drops so that the items hang higher on the bracelets. 7 or 8mm jump rings can also be used if preferred.